DEM simulation of the Central Jet problem from Tsuji et al. Powder Tech 1993. The contours in the background are for gas voidage. 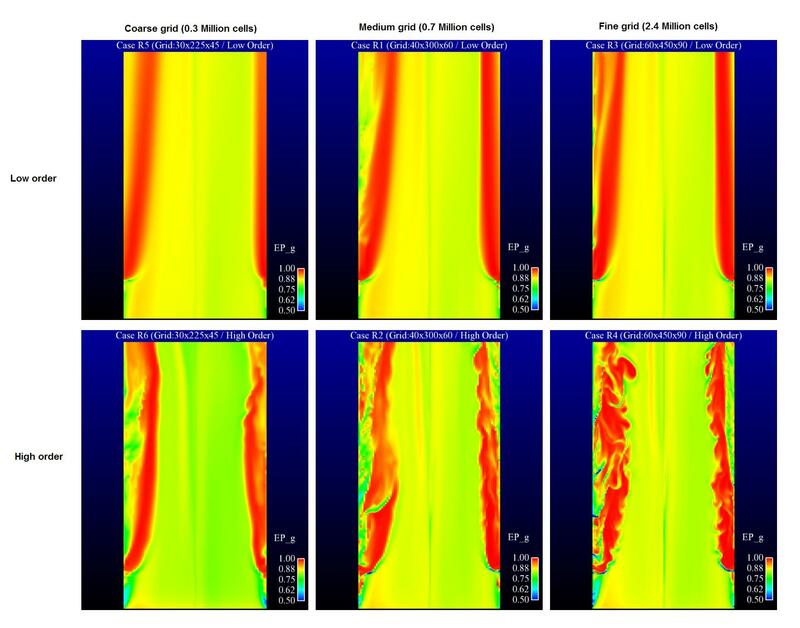 As part of the effort to better understand the coal jet penetration, a reduced configuration of a full commercial scale gasifier was considered by focusing on only the coal jet region using time averaged flow field conditions from a 10 million cell full scale. For this purpose, a 3 m section of the 1.6 m I.D. riser was simulated in cylindrical coordinates. Time-averaged flow field conditions from the full commercial scale simulation were imposed as inflow boundary condition at bottom. Feed composed of air and fresh coal particles was injected into the system at specified gas and solid mass flow rates through two opposite feed ports. Complex coal gasification was modeled with C3M model. Voidage profiles for cases R1-R6 along a clip aligned with two feed jets at t=10 s predicted by different grid resolutions and various discretization schemes are shown in the figure.